There is something unique about backpacking in the spring. Everything in nature is awakening, while there is still some snow on the ground, birds are chirping and the warm sun rays on your face tell you winter is over and this place is starting to come alive! And the best part may be that very few people know about Yosemite's springtime beauty so it feels like the entire valley is our own private playground. We will help keep you safe, warm, and equipped to experience the glory of Yosemite this spring. Gourmet dinners with our camp chef... Not only do we bring the food, but we cook it too! Some Wilderness Trio swag... Could be a hat, shirt, or maybe even a beanie! You never know what kinda treasure you'll score! If you have never backpacked before, no problem! No gear? No problem! Never backpacked before? Also, not a problem! 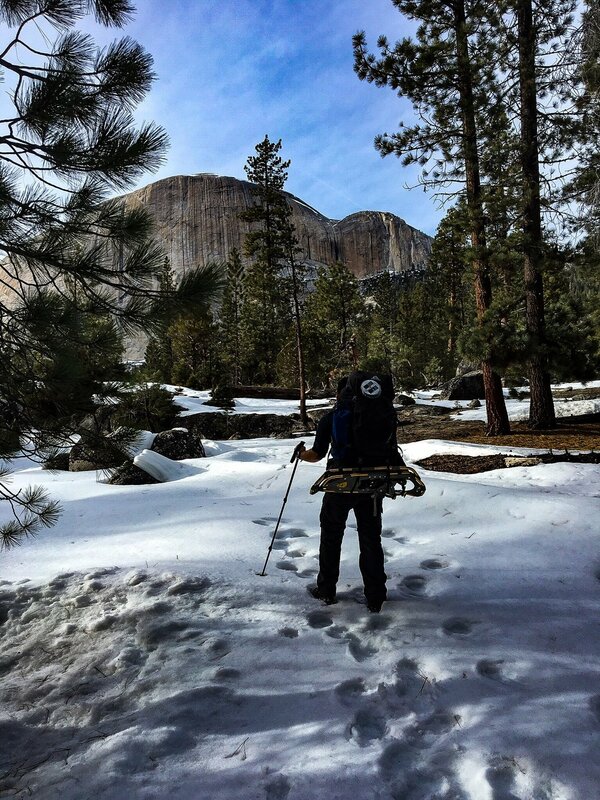 While the routes aren't technical, treacherous, or extremely difficult, just know that snowshoeing requires more energy and activity than traditional hiking. We are expecting to cover around 4-5 miles a day as well as an overall elevation gain of around 2000 feet. We rate our adventures on a 1-5 scale with 1 being the easiest and 5 being the most strenuous. This is a level 4 adventure where we recommend this hike for those who have experienced hiking at higher elevations and or have been handling their own recent day hikes. While previous backpacking experience is not necessary, a little bit does help.